The large soft-pink double flowers of Carter's Sunburst Camellia are flecked and striped with deep fuchsia. One of our favorites! 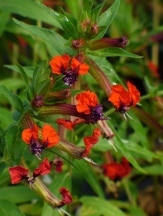 Begins flowering in late fall and continues through early early spring.One of our favorites! 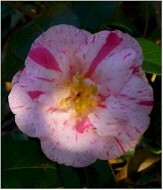 Camellia Culture for Home Gardeners- UGA Extension by James T Midcap etal. 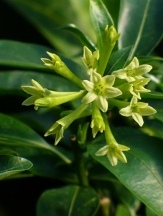 These large evergreen shrubs make easy container plants provided they get regular moisture and a good quality, well-draining, acidic potting soil. We prefer well aged, decomposted bark based mixes over peat based mixes and usually add a little extra sand or hadite to ensure good drainage. Container grown Camellias can suffer root damage if the soil is allowed to freeze so you will want to consider protecting them during any extended periods below freezing. They can usually tolerate overnight temperatures that dip as low as 20-25oF for short periods in 8" or larger containers. When grown or overwintered indoors provide them with plenty of cool direct sunlight. Preferably a few hours in the morning, in the late afternoon, or filtered light, like through a pine, is fine as well with high light conditions the remainder of the day whenever possible. For more on growing Camellias as container plants see the following article by Dan Gill with LSU Agcenter:Camellias are Outstanding in Containers. Soil & Moisture: Average moist, humus rich, acidic soils with good drainage and a deep organic mulch. 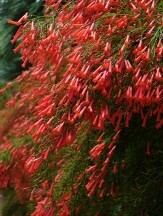 Fertilizing: Use a balanced, slow release, nonburning fertilizer for acid loving plants. Pruning: Once the Camellia flowering season has ended in mid-late spring, before buds set in summer. When to Plant: Plant anytime of year from containers, provide extra moisture during summer if needed. Deer Resistance: Seldom Bothered Deer resistance is relative to how hungry the deer (or other herbivores) are, what food is readily available in their natural habitat, and how tasty a particular plant is. Few plants are truly completely 100% resistant to being browsed by hungry deer and other herbivores. Please realize that this is just a guide based on our experience and research but some plants may never ever be bothered. Dormant Shipping: .Evergreen, though not in active top growth in winter.